Building a rocket at home can be a joyous experience if you doing it with other kids since they get a chance to learn a thing or two as well. There are quite a lot of ways to build a rocket. While some people opt for an already designed rocket, others tend to make it themselves. The actual rocket is just the cylinder. However, the design is what makes your rocket different from all others. First of all you need to draw out your own design. 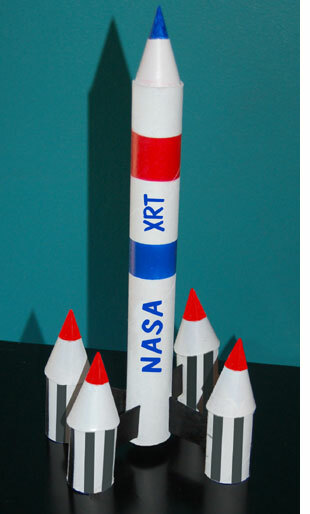 In case this is the first time you are trying to make a rocket, make sure that the design you opt for is simple and easy to make. The overall structure must include a cylinder to make for the body, a nosecone, fins and an engine. Make sure you build up the recovery method or you will have to make another rocket for yourself. Gather all the material and cut it according to your plans. First, attach the nose cone to the body with parachute attached to the back. Plastic cement should be used to join wood with plastic. Later, sand the fins. Make sure that the entire rocket is as smooth as possible because it will aid you in the aerodynamics of the whole structure. If the fins of the rocket are smooth, the air will move easily over the rocket. Most people use balsa wood for completing the fins. After the fins have been sanded, attach them. You can use plastic cement if the body of your rocket is made out of plastic. In case you’re using cardboard, then wood glue will work out fine as well. The engine mount must be attached later on. It must be placed right at the bottom of the rocket, right under the fins. Try to use a cotton swab to add glue to the engine mount. The rocket is now complete and you just need to give it a paintjob. People would mostly add light coats of paint on the entire rocket so that there is no problem in the flight. The easiest way to paint is through masking. Add tape to areas which you want to paint with some other colour. After you have completed painting, remove the tape and paint them later.